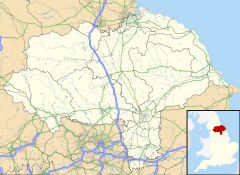 North Skelton is a village in the unitary authority of Redcar and Cleveland and the ceremonial county of North Yorkshire, England. The village is actually 1 mile (2 km) east of Skelton-in-Cleveland and just south of the A174 road between Thornaby and Whitby. North Skelton experienced a boom in the 1870s when North Skelton Ironstone Mine was opened. The mine was the deepest of all of the Cleveland Ironstone workings and its shaft extended to over 720 feet (220 m) in depth. The mine produced over 25,000,000 tonnes (28,000,000 tons) of iron ore between its opening in 1872 and its eventual closure in January 1964. The village used to have a railway station on the line between Teesside and Whitby West Cliff railway station. The station opened to traffic in July 1902 and closed to passengers in September 1951. the line is still open to carry freight from Skinningrove Steelworks and Boulby Mine. North Skelton lends its name to a particular English Long Sword Dance that was performed at villages and towns in the area. The North Skelton Sword Dance, like many other northern dances, is akin to Morris Dancing, but the sword dances are geographical being that they are mainly located in the north. Performances of the North Skelton Sword Dance have been revived by the Claro Sword Dancers. ^ "306" (Map). Middlesbrough & Hartlepool. 1;25,000. Explorer. Ordnance Survey. 2015. ISBN 9780319245583. ^ Lloyd, Chris (20 January 2014). "The end of an era". The Northern Echo. Retrieved 16 October 2017. ^ "North Skelton Mine - Northern Mine Research Society". nmrs.org.uk. Retrieved 16 October 2017. ^ "Durham Mining Museum - North Skelton (Ironstone)". www.dmm.org.uk. Retrieved 16 October 2017. ^ "Disused Stations: North Skelton Station". www.disused-stations.org.uk. Retrieved 16 October 2017. ^ "North Skelton Railway Station". www.nymcam.co.uk. Retrieved 16 October 2017. ^ Porter, Ian (12 January 2009). "Swords and Ploughs". BBC News. Retrieved 16 October 2017. ^ Mitchel, W R (12 June 2008). "Morris travellers". The Yorkshire Post. Retrieved 16 October 2017. ^ Buxton, L H Dudley, ed. (1927). "The 'North Skelton' Sword Dance". The Journal of the English Folk Dance Society. London: Oxford University Press. 1: 28. ISSN 1756-0985.